Thought I'd throw this up for everyone interested in the facilities of the FUTURE CUSA. If you have new info or anything in the list changes you can post it here and I'll update the first post. ODU has men's and women's soccer. The men have been ranked top 25 at various times in both of the last 2 seasons. Not sure about capacity of the soccer stadium, but I believe they draw well. UTSA is currently building a soccer stadium for the women's soccer team out at the currently-under-construction Park West Athletic Complex. It will initially have 1,000 permanent seats and but will be later on expanded to 5,000 permanent seats. (05-19-2012 04:18 PM)FearTheLion Wrote: ODU has men's and women's soccer. The men have been ranked top 25 at various times in both of the last 2 seasons. Not sure about capacity of the soccer stadium, but I believe they draw well. Updated with the name. Can't find a capacity on the ODU Sports page. Updated top post and wiki page. Just looked it up. Capacity is 2,500. (05-19-2012 04:47 PM)FearTheLion Wrote: Just looked it up. Capacity is 2,500. Thanks for the post 49r. Nice to see all of these numbers in one place. I knew that ODU's football would be way down there, but didn't expect us to have the 5th largest basketball stadium.. Seems like there aren't any HUGE bball arenas in C-USA. FIU using their football stadium for soccer...man, imagine if they could sell out soccer. The Sun Bowl was renovated to accomodate soccer, so if UTEP needed they could have a 51k soccer stadium. While that is fundamental, I am more concerned with how they fill up and how the teams consistently perform within those confines. We have been debating all this for many years FYI but welcome to the party. Here are all of ODU's athletic facilities. LINK First link includes the plans for our new basketball practice facility, which will be added on to the Ted. Is Charlotte planning on expanding their football stadium like ODU is..? 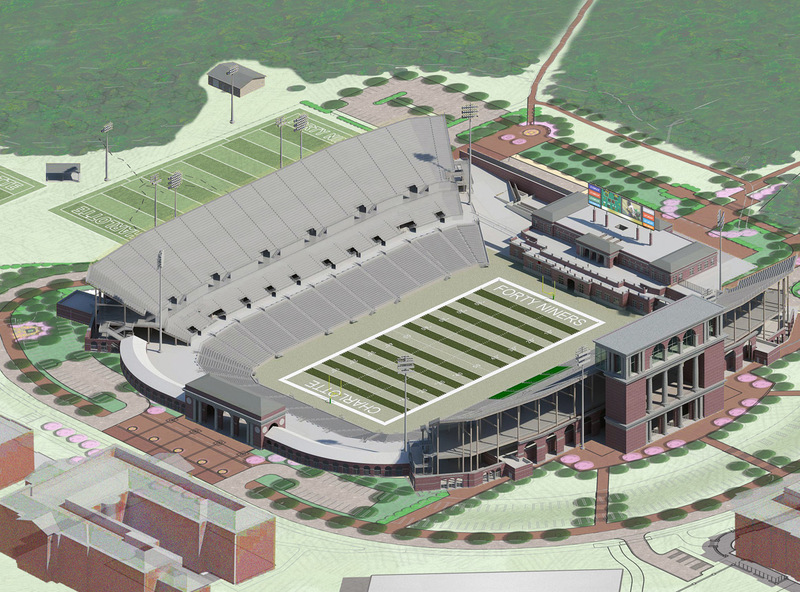 (05-20-2012 12:19 AM)RowdyRunnerRowd Wrote: Is Charlotte planning on expanding their football stadium like ODU is..? Yes, how is another question. Immediate option is temporary seating on the concourse level. There's room for 10,000 but at the press conference, Judy said we'd probably use temp bleachers only to get us to 20,000 (5000 temp). Nice like them both..Obviously the 40k is going to be sick when built. I didn't realize it was going to be 10,000 seats. That's got to be one of the largest dedicated college soccerfield in the country. (05-20-2012 06:32 PM)lmckay92 Wrote: I didn't realize it was going to be 10,000 seats. That's got to be one of the largest dedicated college soccerfield in the country. Hamrick said if you can't build 1st class facilities, then you shouldn't build them at all. As I said this is being built the way it is, hopefully to attract NCAA regional play.